Tonight Cosmic Praise will be live on air with Radio Ninja on WMBR interviewing the mad scientist himself: Doug Ruuska! Tune in to 88.1fm at 10pm EST to learn more from the Artist in Chief about this crazy tower we are building… stick around for the sick beats of Radio Ninja! Available in the greater Boston area at 88.1fm or streaming online at WMBR.org anywhere the internet can be found. 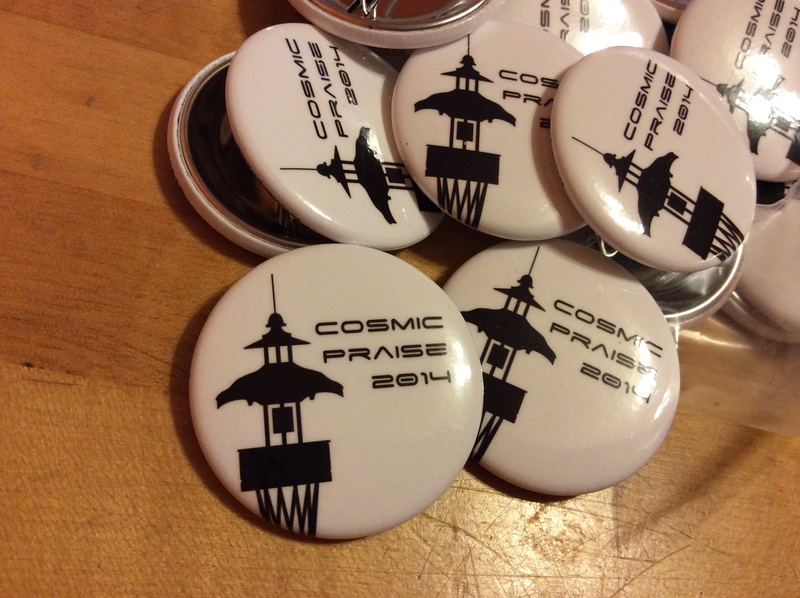 First wave of Cosmic Praise pins have arrived! In more news, we are thrilled to be able to offer a truly eye-opening very limited Kickstarter Reward! If you have Early Arrival on Playa for this 2014 year, you are eligible to reach out and snag one of the 6 spots available to partake in a Gates Opening Cheese & Grown-Up-Grape-Juice Reception. Our only on-Playa reward, for just a few Early Arrival citizens of Black Rock City BEFORE the gates open. Join the artists atop the tower for an intimate 2-hour cheese and grown-up-grape-juice reception, which finally culminates in watching from above, as BRC gates open and the very first waves of arrivals enter the City. Recovering physicist Doug Ruuska will share his favorite fine cheeses; along with cheesy explanations of physics, or life in the Antarctic, or really any topic. Watch the City be populated from a 6 o’clock bird’s eye view, and also receive the sticker, pin and (p)leather fob! NOTE: Participants are responsible for ensuring your own Early Arrival status so that you may join us. The sights and sounds of the floodgates opening up to the citizens of Black Rock will truly not be an experience to miss out on… Grab your spot under the cupula before it is too late! Most excitingly of all is the Campaign Goal within sight (!!!) with 87% funding achieved and barely over $1,000 left to reach our first campaign goal! With the campaign fully funded we will have garned the bare means necessary to accomplish the great task ahead… thankfully for us the campaign is no where near concluded, and so with one great step closer to the Playa running up to meet us, we look on to our vitally important super saavy Stretch Goals. Outside the campaign trail, it can be difficult to understand simply how important the stretch goals are, enabling the project to grow, breathe and expand out to its full potential. More details very soon to be forthcoming, including more playa wear, and the announcement of a truly shocking hair raising Kickstarter Reward! Start your social media engines to post to facebook, email it to your mother, tweet until your twitterpated, break out the cymbals and shout it from the rooftops, because the Cosmic Praise Kickstarter is LIVE! Fundraising ends in 30 days. The Man burns in 79 days.